The Gospel According to Luke [Greek: Τὸ κατὰ Λουκᾶν εὐαγγέλιον, to kata Loukan euangelion], commonly shortened to the Gospel of Luke or simply Luke, is the third and longest of the four Gospels accepted as canon by most Christians. This synoptic gospel is an account of the life and ministry of Jesus of Nazareth, detailing his story from the events of his birth to his Ascension. Certain popular stories, such as those of the Prodigal Son and the Good Samaritan, are found only in this gospel. Jesus is presented as Son of God, but attention is especially paid to his humanity, featuring his compassion for the weak, the suffering, and the outcast. The author is traditionally identified as Luke the Evangelist, but modern scholars generally reject the view that he was the author, because of a number of possible contradictions between Acts and Paul's letters; Biblical scholars are in wide agreement that its author also wrote the Acts of the Apostles, and many believe that these two books originally constituted a two-volume work. 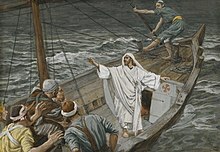 Most modern critical scholarship concludes that Luke used the Gospel of Mark for its chronology and a hypothetical sayings source, the Q document for many of Jesus' teachings. Traditional scholarship has dated its composition to the early 60s, while some critics date it to later decades of the 1st century. Judge not, and ye shall not be judged: condemn not, and ye shall not be condemned: forgive, and ye shall be forgiven. They came to him, and awoke him, saying, Master, master, we perish. Then he arose, and rebuked the wind and the raging of the water: and they ceased, and there was a calm. The kingdom of God cometh not with observation: Neither shall they say, Lo here! or, lo there! for, behold, the kingdom of God is within you. I say unto you, Whosoever shall not receive the kingdom of God as a little child shall in no wise enter therein. The Son of man is come to seek and to save that which was lost. With desire I have desired to eat this passover with you before I suffer: For I say unto you, I will not any more eat thereof, until it be fulfilled in the kingdom of God. This is my body which is given for you: this do in remembrance of me. … This cup is the new testament in my blood, which is shed for you. And, lo, the angel of the Lord came upon them, and the glory of the Lord shone round about them: and they were sore afraid. And the angel said unto them, Fear not: for, behold, I bring you good tidings of great joy, which shall be to all people. For unto you is born this day in the city of David a Saviour, which is Christ the Lord. And this shall be a sign unto you; Ye shall find the babe wrapped in swaddling clothes, lying in a manger. And suddenly there was with the angel a multitude of the heavenly host praising God, and saying, Glory to God in the highest, and on earth peace, good will toward men. And if you lend to those from whom you expect repayment, what credit is that to you? Even sinners lend to sinners, expecting to be repaid in full. But love your enemies, do good to them, and lend to them without expecting to get anything back. Judge not, and ye shall not be judged: condemn not, and ye shall not be condemned: forgive, and ye shall be forgiven: Give, and it shall be given unto you; good measure, pressed down, and shaken together, and running over, shall men give into your bosom. For with the same measure that ye mete withal it shall be measured to you again. 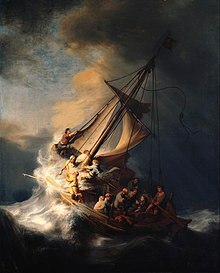 Now it came to pass on a certain day, that he went into a ship with his disciples: and he said unto them, Let us go over unto the other side of the lake. And they launched forth. But as they sailed he fell asleep: and there came down a storm of wind on the lake; and they were filled with water, and were in jeopardy. And they came to him, and awoke him, saying, Master, master, we perish. Then he arose, and rebuked the wind and the raging of the water: and they ceased, and there was a calm. 9:55–56 Rebuking James and John for asking if he would command fire to come down from heaven, to consume a village of Samaritans for not receiving them, because they seemed to be headed for Jerusalem. A certain man went down from Jerusalem to Jericho, and fell among thieves, which stripped him of his raiment, and wounded him, and departed, leaving him half dead. And by chance there came down a certain priest that way: and when he saw him, he passed by on the other side. And likewise a Levite, when he was at the place, came and looked on him, and passed by on the other side. 10:31–37 The famous parable of the Good Samaritan. When there were gathered together an innumerable multitude of people, insomuch that they trode one upon another, he began to say unto his disciples first of all, Beware ye of the leaven of the Pharisees, which is hypocrisy. For there is nothing covered, that shall not be revealed; neither hid, that shall not be known. Therefore whatsoever ye have spoken in darkness shall be heard in the light; and that which ye have spoken in the ear in closets shall be proclaimed upon the housetops. And I say unto you my friends, Be not afraid of them that kill the body, and after that have no more that they can do. But I will forewarn you whom ye shall fear: Fear him, which after he hath killed hath power to cast into hell; yea, I say unto you, Fear him. "This is how it will be with anyone who stores up things for himself but is not rich toward God." Unto whomsoever much is given, of him shall be much required: and to whom men have committed much, of him they will ask the more. And he said also to the people, When ye see a cloud rise out of the west, straightway ye say, There cometh a shower; and so it is. And when ye see the south wind blow, ye say, There will be heat; and it cometh to pass. Ye hypocrites, ye can discern the face of the sky and of the earth; but how is it that ye do not discern this time? Yea, and why even of yourselves judge ye not what is right? 12:51–57 (KJV) Variant translation of 12:57: Why do you not judge for yourselves what is right? Saying 3: "If those who lead you say, 'See, the Kingdom is in the sky,' then the birds of the sky will precede you. If they say to you, 'It is in the sea,' then the fish will precede you. Rather, the Kingdom is inside of you, and it is outside of you. When you come to know yourselves, then you will become known, and you will realize that it is you who are the sons of the living Father. But if you will not know yourselves, you dwell in poverty and it is you who are that poverty." Saying 113 : His disciples said to Him, "When will the Kingdom come?" Suffer little children, and forbid them not, to come unto me: for of such is the kingdom of heaven. Verily I say unto you, Whosoever shall not receive the kingdom of God as a little child shall in no wise enter therein. Behold, there was a man named Zacchaeus, which was the chief among the publicans, and he was rich. And he sought to see Jesus who he was; and could not for the press, because he was little of stature. And he ran before, and climbed up into a sycomore tree to see him: for he was to pass that way. And when Jesus came to the place, he looked up, and saw him, and said unto him, Zacchaeus, make haste, and come down; for to day I must abide at thy house. And he made haste, and came down, and received him joyfully. And when they saw it, they all murmured, saying, That he was gone to be guest with a man that is a sinner. And Zacchaeus stood, and said unto the Lord: Behold, Lord, the half of my goods I give to the poor; and if I have taken any thing from any man by false accusation, I restore him fourfold. And Jesus said unto him, This day is salvation come to this house, forsomuch as he also is a son of Abraham. For the Son of man is come to seek and to save that which was lost. He added and spake a parable, because he was nigh to Jerusalem, and because they thought that the kingdom of God should immediately appear. He said therefore, A certain nobleman went into a far country to receive for himself a kingdom, and to return. And he called his ten servants, and delivered them ten pounds, and said unto them, Occupy till I come. But his citizens hated him, and sent a message after him, saying, We will not have this man to reign over us. And it came to pass, that when he was returned, having received the kingdom, then he commanded these servants to be called unto him, to whom he had given the money, that he might know how much every man had gained by trading. Then came the first, saying, Lord, thy pound hath gained ten pounds. And he said unto him, Well, thou good servant: because thou hast been faithful in a very little, have thou authority over ten cities. And the second came, saying, Lord, thy pound hath gained five pounds. And he said likewise to him, Be thou also over five cities. And another came, saying, Lord, behold, here is thy pound, which I have kept laid up in a napkin: For I feared thee, because thou art an austere man: thou takest up that thou layedst not down, and reapest that thou didst not sow. And he saith unto him, Out of thine own mouth will I judge thee, thou wicked servant. Thou knewest that I was an austere man, taking up that I laid not down, and reaping that I did not sow: Wherefore then gavest not thou my money into the bank, that at my coming I might have required mine own with usury? And he said unto them that stood by, Take from him the pound, and give it to him that hath ten pounds. (And they said unto him, Lord, he hath ten pounds.) For I say unto you, That unto every one which hath shall be given; and from him that hath not, even that he hath shall be taken away from him. But those mine enemies, which would not that I should reign over them, bring hither, and slay them before me. John Chrysostom (349–ca. 407), Eight Homilies Against the Jews, Homily 1. At the mount called the mount of Olives, he sent two of his disciples, saying, Go ye into the village over against you; in the which at your entering ye shall find a colt tied, whereon yet never man sat: loose him, and bring him hither. And if any man ask you, Why do ye loose him? thus shall ye say unto him, Because the Lord hath need of him. Then began he to speak to the people this parable; A certain man planted a vineyard, and let it forth to husbandmen, and went into a far country for a long time. And at the season he sent a servant to the husbandmen, that they should give him of the fruit of the vineyard: but the husbandmen beat him, and sent him away empty.And again he sent another servant: and they beat him also, and entreated him shamefully, and sent him away empty. And again he sent a third: and they wounded him also, and cast him out. He shall come and destroy these husbandmen, and shall give the vineyard to others. And when they heard it, they said, God forbid. And he beheld them, and said, What is this then that is written, The stone which the builders rejected, the same is become the head of the corner? Therefore, resolve in your hearts not to rehearse beforehand how to make your defense, 15 for I will give you words and wisdom that all your opposers together will not be able to resist or dispute. And when the hour was come, he sat down, and the twelve apostles with him. And he said unto them, With desire I have desired to eat this passover with you before I suffer: For I say unto you, I will not any more eat thereof, until it be fulfilled in the kingdom of God. And he took the cup, and gave thanks, and said, Take this, and divide it among yourselves: For I say unto you, I will not drink of the fruit of the vine, until the kingdom of God shall come. And he took bread, and gave thanks, and brake it, and gave unto them, saying, This is my body which is given for you: this do in remembrance of me. Likewise also the cup after supper, saying, This cup is the new testament in my blood, which is shed for you. Verily I say unto thee, Today shalt thou be with me in paradise.